Ethical - natural experience for our herds, roam freely -plenty of open space, limited human interaction. Respectful - a stress-free environment to grow up in. Our herds are treated with respect and dignity and we are constantly working to develop new methods to give the herds the highest quality of life as they move from prairie to plate. Cyrus Bison Inc. is owned and operated by Dr. Nathaniel Ostashewski and his wife Susan Ostashewski, both born and raised in rural Alberta. Nathaniel is a Athabasca University Professor and Susan is a Fitness Instructor dedicated to bringing Zumba to rural Alberta. Both Nathaniel and Susan have been passionate in teaching and performing Ukrainian Dance and have recently taken that passion in another direction - bison ranching! Raising 6 children, being grandparents, and being involved in the family farm keep them busy as most Albertans are! Bison ranching and grain farming started with the Ostashewski family farm operated in the Lamont, Alberta. With roots in Biggar, Saskatchewan and Star, Alberta - Bill and Marcella Ostashewski began farming full time in 1974 raising cattle, grain, chickens and eggs for sale. Marcella's dream was to bring Bison into the farm operations and in 2004 O'Honey Farms did so in a big way, starting with almost 100 bison cows 10 km east of Elk Island National Park. The Elk Island Park is home to the most genetically pure herds of Plains and Wood Bison in the World, and these majestic animals were always in Marcella's mind as she often made trips to Edmonton through Hwy 16 that cuts through the park. While Marcella is no longer with us, Bill Ostashewski continues to operate the bison and grain farm and is know in the Lamont area as the Honey and Bison guy or Buffalo Bill. Bill, a retired school teacher of 43 years with Edmonton Catholic Schools, still grows a large garden, operates a 1200 acre grain farm, and manages 300 bison. In 2010, Nathaniel and Susan Ostashewski decided to continue the family farm tradition and take on Bison ranching as part of their rural life. They are working towards 300 Bison cows in three herds - a Purebred Wood Bison herd, a Purebred Plains Bison herd, and a Commercial Bison Cross herd. In 2014 the Ostashewski's were thrilled to purchase some of the Wood Bison from the Park which form the basis of our Purebred Woods Herd. 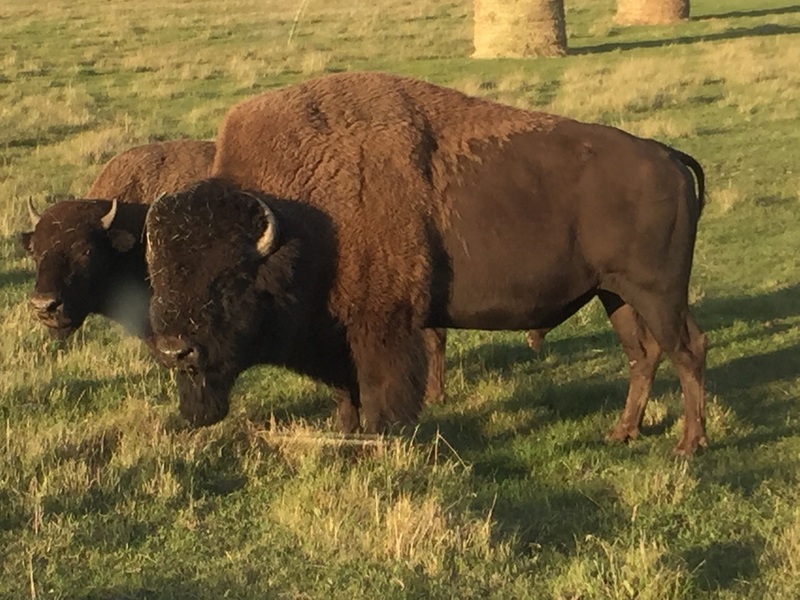 Preserving bison genetics, producing natural bison meat for tables in North America, and exploring ways in which to utilize bison fiber in clothing with our Partners United By Blue are the goals of the Cyrus Bison operation.